“Taking a hit by choice” was about the reduced margins Facebook is projecting thanks to its dramatically increased spending on security; it hurts in the short-term, but keeping people on the platform and regulators away has massive long-term value. It should be noted that Instagram Stories in particular (along with Stories on Facebook’s app) are in a similar vein: their strategic impact, particularly in terms of Facebook’s competitive position relative to Snapchat, will be felt for years. 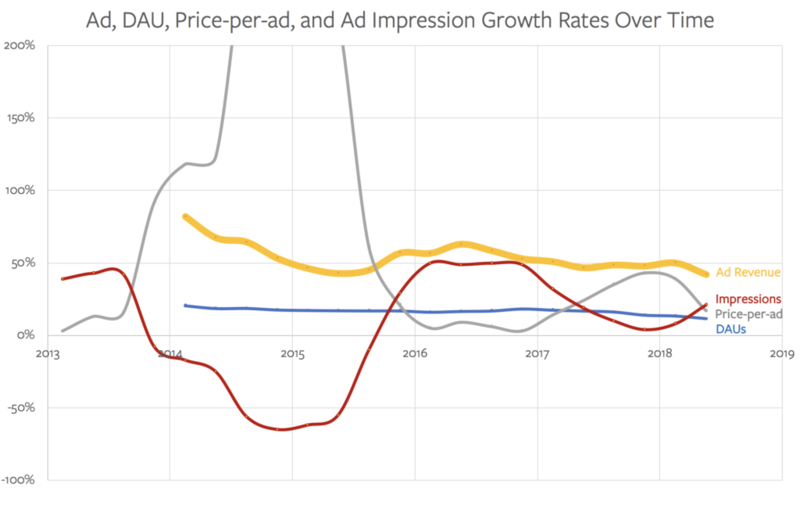 That huge anomaly between 2014 and 2016 marked the dramatic reduction in Facebook’s side-bar ads, which had been the company’s chief money-maker for years; that reduced the number of impressions, but the resultant shift in ad inventory mix to News Feed ads led to an even more dramatic increase in Facebook’s reported price-per-ad. The years after the mix shift have only reinforced just how good the News Feed ad unit is: by 2016 the shift was complete and Facebook just grew and grew, quarter after quarter (remember, that chart is growth rates; a chart of absolute numbers would be up-and-to-the-right. 2017 was even more interesting: the company said it would stop increasing ad load in the News Feed, which is why impressions fell, but the price-per-ad increased in response. This demonstration of pricing power is as clear an indication as you can get that Facebook’s News Feed ad was highly differentiated.